We analyse the price of bitcoin at the start of every year back to 2012 to assess whether the January effect may be a phenomenon in cryptocurrencies as well as the stock market. Some strong similarities are found despite the limited lifespan of the cryptocurrency market. The start to 2019 has been characterized by an early rise and a sharp-sell off. Many had bullish hopes for 2019 after 2018 wrapped up its bearish year with a price rise. 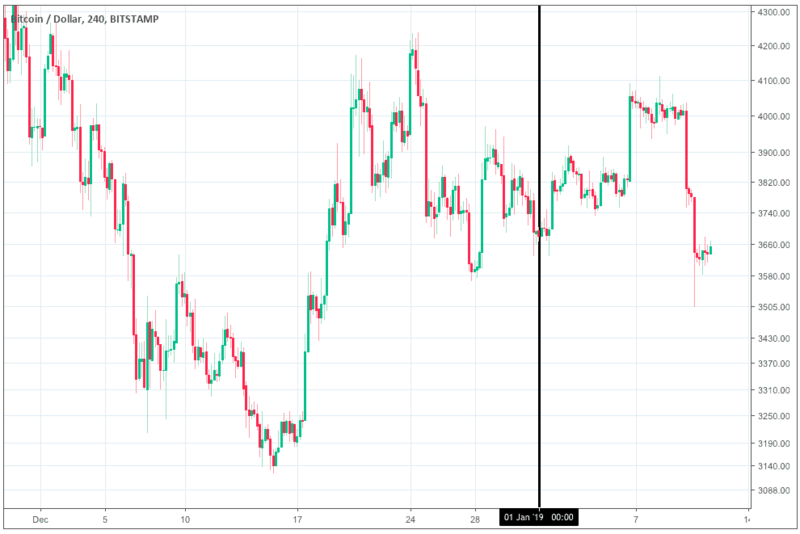 2019 started with prices rising but this week saw a sharp sell-off occurring across the cryptocurrency market. This may not come as a surprise to those who are familiar with previous yearly starts to the cryptocurrency market. The performance of the top 5 cryptocurrencies we have seen at the start of 2019 is highly characteristic of previous yearly beginnings. The January effect is a well-documented phenomenon in the stock market, but does it apply to cryptocurrencies? 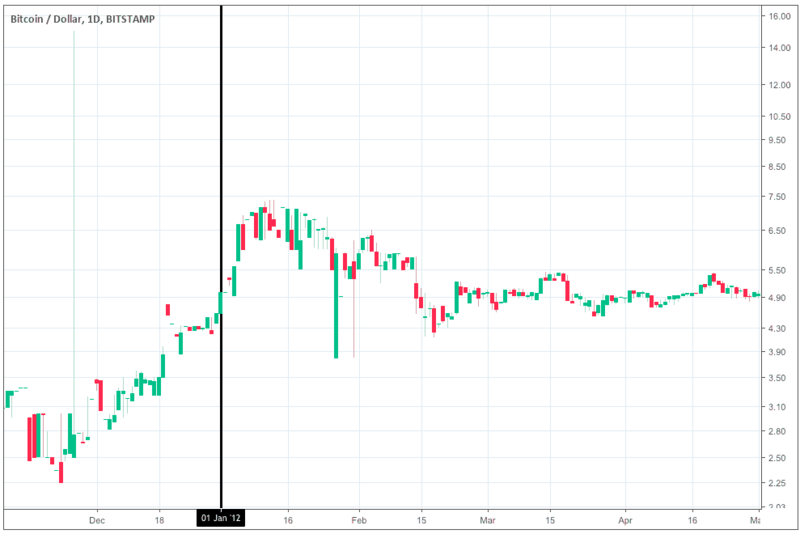 We analyze the different yearly starts of Bitcoin from as far back as 2012 to assess whether the January effect may also be a phenomenon in cryptocurrencies. All charts used in this post are logarithmic charts which make percentage price changes equivalent to each other. For example, a move from $1 to $10 would be the same as a move from $10 to $100 on a logarithmic chart. On a normal scale, the move from $1 to $10 would be barely visible. The price data is all based on the price of Bitstamp exchange. 2011 wrapped up with price surging. 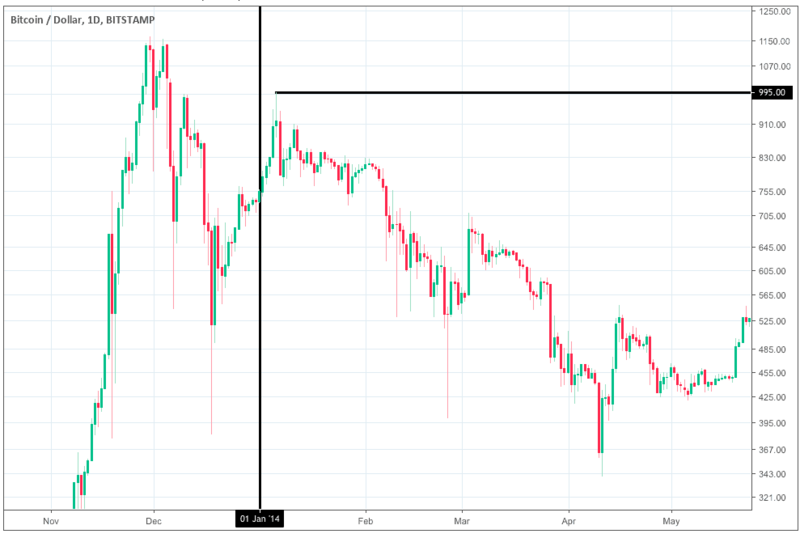 Price opened on January 1st, 2012 at $4.90 and rose to a high of $7.38 on 12th January before subsequently crashing to $3.80. 47.6% increase from January 1st open to January 12th price high. 48.5% fall from high to low on the January 27th. 181 days before price reached January’s high again. 2013 was the outlier of yearly starts so far. Although it started off with sideways trading, price mostly surged for the month of January. 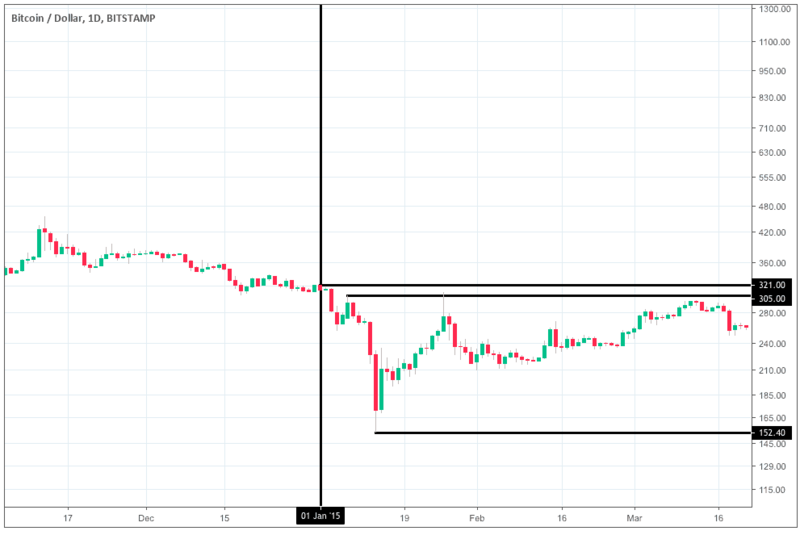 Bitcoin managed to make a movement above $1100 in the last quarter of 2013 and crashed back down below $400 within the same quarter. 2013 was wrapping up with Bitcoin surging once again and opened on the new year at $730. The upward movement continued in 2014 but stopped short of the $1000 mark and made a high of $995 before crashing. Price continued to decrease until a $152 low was formed in January of 2015. 36% increase from January 1st, 2014 to high on the 6th. 85% decrease from January 6th high to $152 low which was formed on 14th of January 2015. 1090 days before price reached $995 high again. 2015 started with a continuation of the prolonged decrease we had been seeing since the high recorded in January of 2014. Price sold off as the year started and made an attempt at a recovery which formed a high around $305. However, this was followed by another sharp sell-off which brought the price to a low of around $152. Prices started making a recovery in the last quarter of 2015 from the early sharp drops which occurred. Price opened 2016 around $430, and after a few days of sideways trading, price increased to $465. Price had still not recovered from the major crash which took place in 2014. 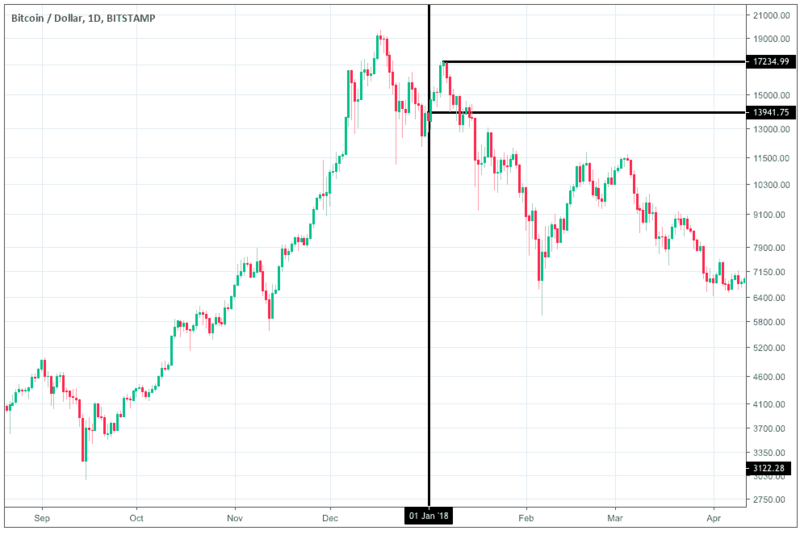 After forming a high at $465, price did follow up with a crash but began recovering to reach the $465 high in the space of a few months. 2017 is still clear in many of our memories. This year actually started by recovering the highs formed at the start of 2014 on the 1st of January. Price opened at $960 and made a surge up to $1140 within the first few days. This was followed up with a steep crash down to $755. From this point, many of us still clearly remember the prolonged increase which took place after this. 2018 strikes similarities with 2014. 2017 wrapped up with price undergoing enormous increases. 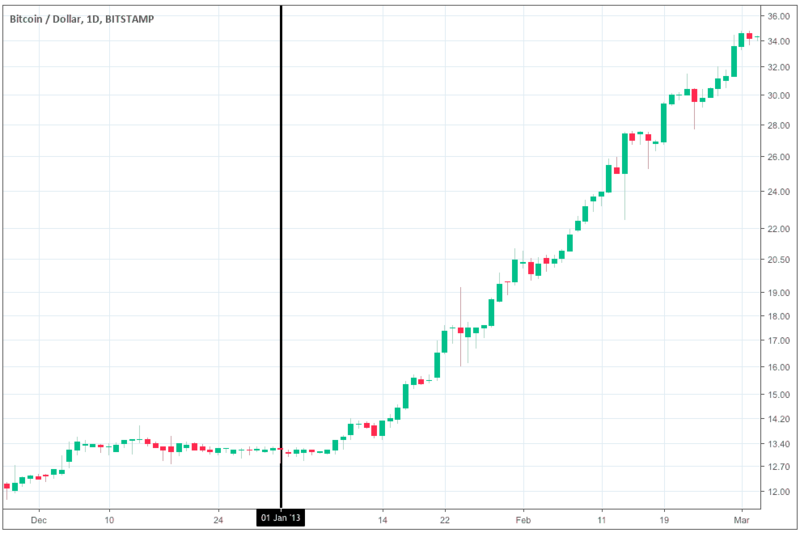 Although January 1st recorded a loss after opening at $13,940, the price quickly began a recovery and formed a high of $17,234 on the 6th of January. However, this began the prolonged decrease which we are still experiencing today. 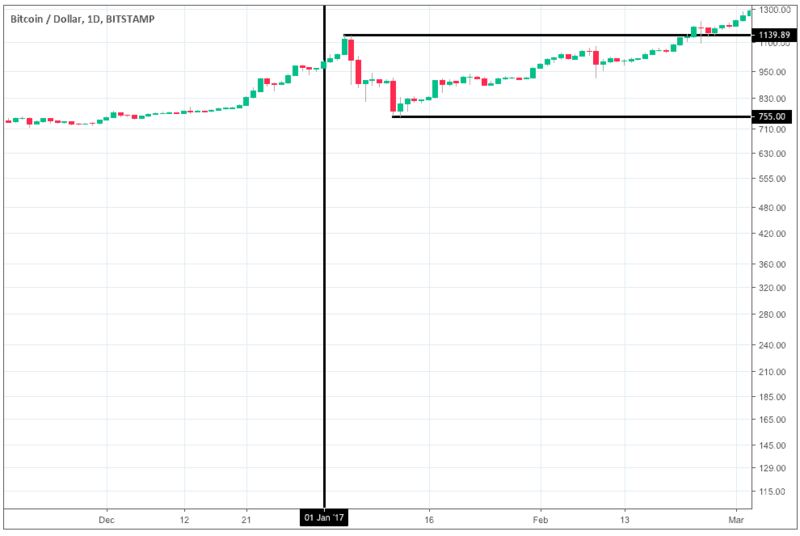 The lowest price formed since this point has been $3122 in December of 2018. 2019 is only after beginning, but it has started very similarly to other years. Price opened at $3693 and continued to surge to form a high of $4112 on the 8th of January. Price has since begun crashing just last week and has so far formed a low of $3503. It is yet to be seen whether the crash which started in January of 2018 has reached its lows. The crash which began on January 2014 that took three years to recover and reached its low point in January of 2015. 11% increase from open to January 8th high. 15% decrease so far from January 8th high to 2019 low. 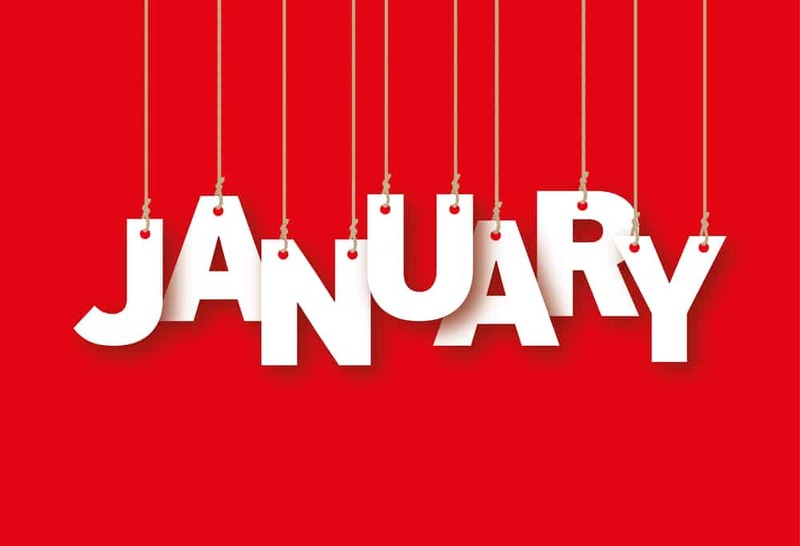 Does the January Effect Exist? There is too little data to make a clear distinction about whether a January effect exists or not, but similarities do exist when the price performances are compared. This definitely does not mean that price will always increase at the start of the year and subsequently crash, but it is something traders can be aware. One interesting comparison which is yet to play out is the similarity between 2014 and 2018. Both started the year surging after extraordinary increases in the prior years. After the 2014 price high in January, price took almost three years to recover to this high. The low of this crash was priced in January of 2015. 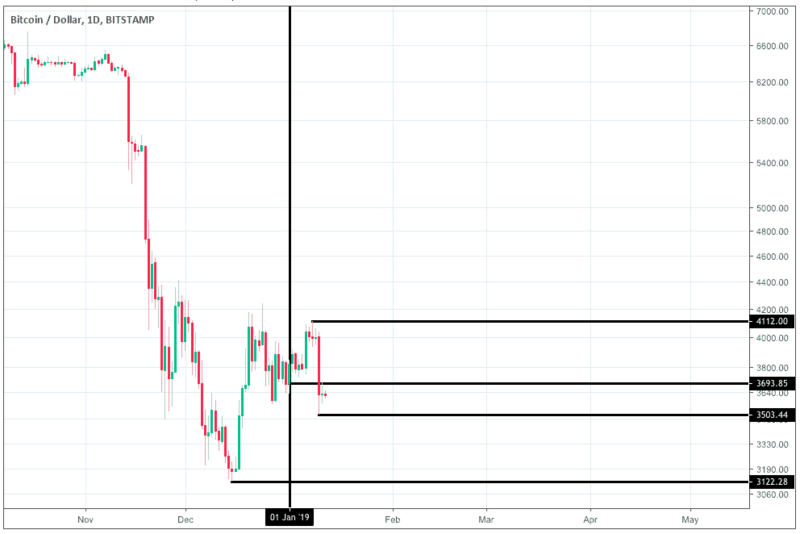 We have yet to see price even begin a significant recovery towards the highs seen in January of 2018. It is still unclear of whether the low is formed. 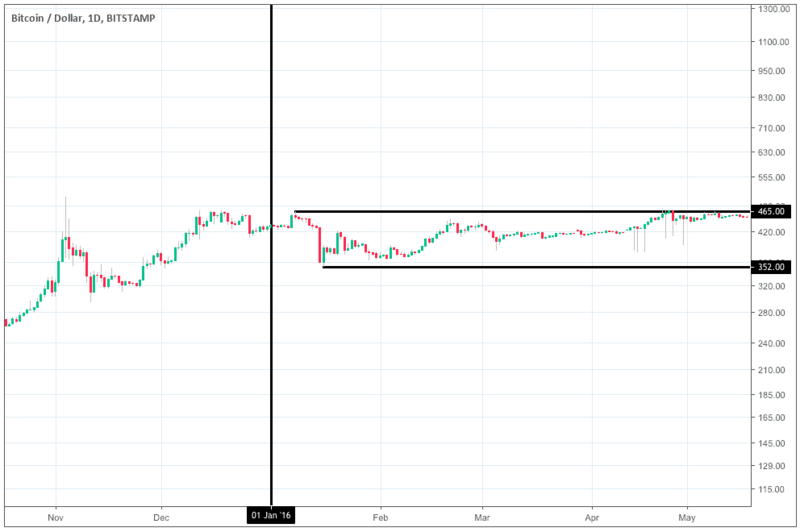 It is possible that we could see a similar scenario to 2014 where price took about a year to find its low and then began an even longer price recovery to the former highs.